Illinois State University Criminal Justice Professor Ralph Weisheit previews a presentation "Legal Marijuana in Illinois," April 3 at the Normal Library in an interview at WGLT. Illinois has a marijuana-friendly governor pushing through his agenda on a variety of initiatives at a rapid pace, but at least one longtime observer of the criminal justice system and the war on drugs says legal pot for recreation is not going to happen quickly. Illinois State University Criminal Justice Professor Ralph Weisheit has published eight books and more than 40 articles in professional journals about the drug-crime connection. Among his books is one called "Domestic Marijuana: A Neglected Industry," in which he interviews growers, law enforcement and others connected with growing operations. "Sometimes making predictions about patterns of drug use is like fashion. You can look back in hindsight but predicting ahead of time can be tough." Weisheit said the public's perception of marijuana has changed dramatically since he published that book about domestic growers in 1992. But he says lawmakers' perceptions haven't necessarily caught up. "Twenty years ago the idea of medical (use of marijuana) would have been just about unheard of outside of California. Recreational (use) would have been completely unheard of and it’s changed far more quickly in the public’s eye than in the eyes of lawmakers,” he suggested. But he predicts it could be the end of the year before the General Assembly takes action to allow recreational use of pot. Illinois has a history of taking a conservative approach to marijuana. The state’s three-year pilot allowing medical use of marijuana limited the number of conditions for which it would be recommended, and Weisheit agrees that by most standards, it was one of the most conservative medical marijuana laws in the country. However, he said cultivators were OK with that conservative approach. So why is there such a strong push for recreational use in Illinois now? Weisheit said it's because other states are doing it and raising a lot of tax revenue without a lot of highly publicized problems. And he said there haven’t been any high-profile stories of Illinois residents with a medical card committing crimes or creating a public threat. 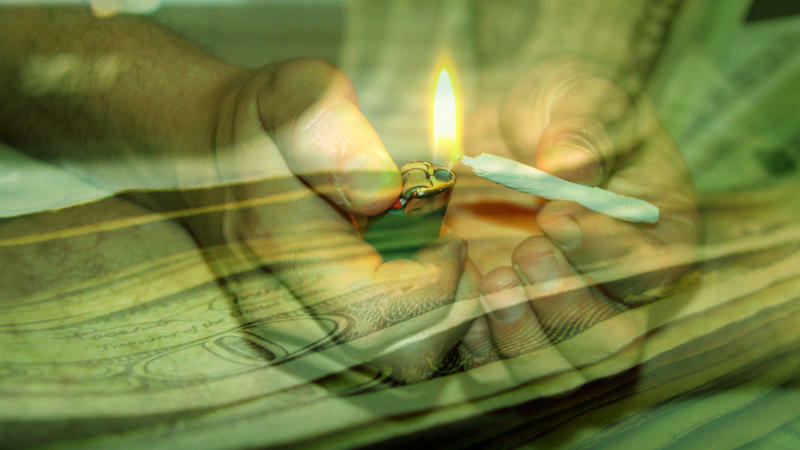 There are several estimates about the tax and job benefits of legalizing cannabis. A report published by the nonprofit Illinois Economic Policy Institute said Illinois could generate a half-billion dollars in tax revenues, create more than 23,000 jobs and boost the state’s economy by $1 billion a year. A bill introduced in the Illinois General Assembly in 2017 would set aside half of the tax revenue for k-12 schools and colleges. To avoid the kind of problems a cash-only crop has created in California, where it has been a challenge to make sure cash makes its way to designated state budget funds, llinois Treasurer Michael Frerichs has called for changes to rules that prohibit banks from providing basic services to the legal cannabis industry. 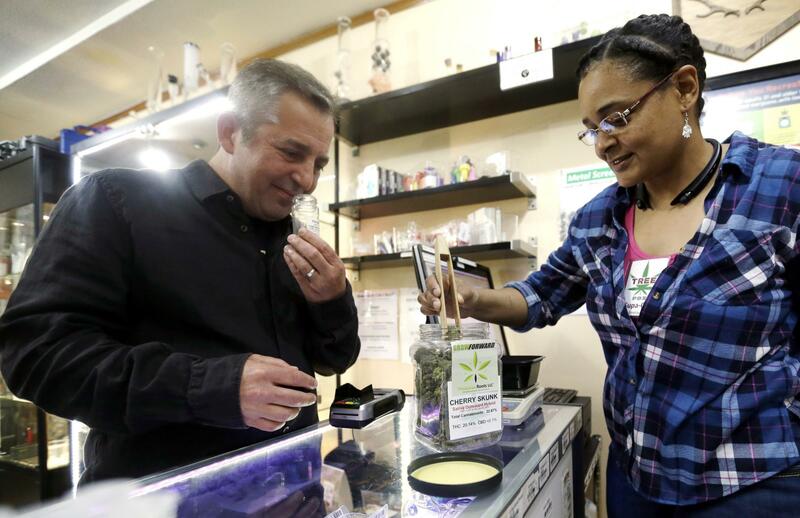 Adam Smith, left, founder and executive director, Oregon Craft Cannabis Alliance, is shown a marijuana variety called Cherry Skunk by Tree PDX marijuana shop owner Brooke Smith at her shop in Portland, Ore., in 2018. Those businesses would be able to write checks, deposit money and take out loans. Weisheit said that's an important change that would make it easier to account for marijuana-related tax revenue that is supposed to go to schools if that’s part of final legislation. But how the final bill will actually take shape is anyone’s guess. Weisheit thinks one challenge will be how to deal with edibles and the problems their consumption has posed in other states. For example, in Colorado from 2014 to 2016, almost 11 percent of cannabis-related emergency department visits at UCHealth University of Colorado were due to edibles. Weisheit said dosing is an issue because of the delayed absorption of the THC in marijuana which is what gives users the high. Who will decide those THC limits and the size of edibles are among the challenges Weisheit predicts will complicate the process of drafting legislation. “This is why it’s going to take longer for the law to pass. Not because people in the legislature are necessarily opposed to the idea but they’re going to be very concerned about the details,” he said. The professor also speculates a final version of the law will also put THC limits on marijuana that is smoked. The Illinois chapter of the American Academy of Pediatrics has adopted the national organization’s opposition to legalizing marijuana due to concerns about the impact on adolescent brains and development. The Chicago-based Illinois State Medical Society’s House of Delegates has also voiced opposition along with the Illinois Society of Addiction Medicine. However, Weisheit points out Illinois teenagers already have access to marijuana which can be laced with a variety of more harmful substances. He said there is also a surprising development from legalization in Colorado—teen use of marijuana has drifted lower. “One of the things we know from Colorado is that use by teenagers from self-report studies has not gone up when it’s become legal. Why would that be true? I don’t actually know,” he offered. “Sometimes making predictions about patterns of drug use is like fashion; you can look back in hindsight but predicting ahead of time can be tough,” he said with a laugh. There were new marijuana-related developments recently in Washington. Weisheit said it appears the U.S. Treasury is signalling there could be a move soon to allow marijuana growers to use the nation’s federal banking system, and there is at least one other measure seen as having good chances of becoming law—a proposal to allow the nation’s many PTSD-scarred veterans access to medical marijuana. The logistics of how that medical marijuana would be supplied are not quite clear, according to Weisheit. Even without any changes in federal law, if Illinois legalizes recreational marijuana, Weisheit said there will be a problem of figuring out supply and demand. 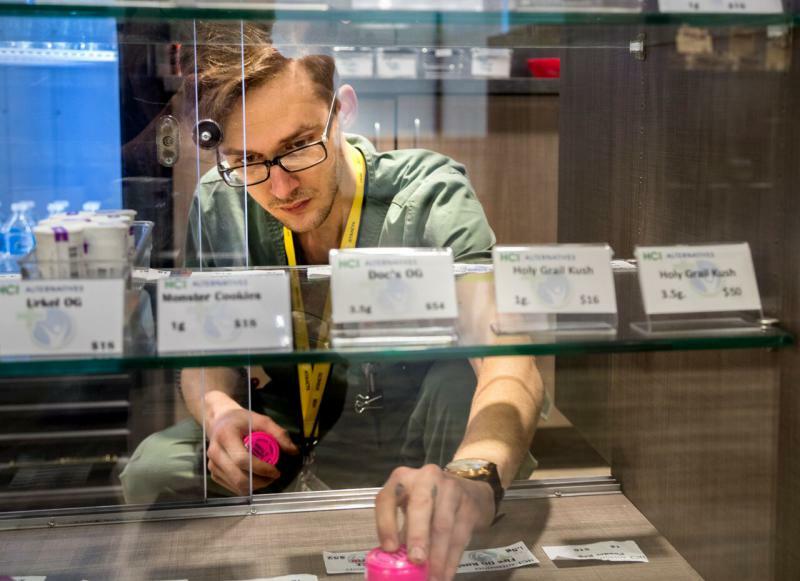 Will medical producers be able to ramp up to meet a pent-up demand for recreational marijuana? Or, he suggests, there could be an excess supply problem. Weisheit will be presenting “Legal Marijuana in Illinois” at 7 p.m. Wednesday, April 3, in the Community Room at Normal Public Library. A Bloomington doctor who will soon head the Illinois State Medical Society said the physicians group has concerns about the state's efforts to legalize recreational marijuana, but the group hasn’t yet taken a formal stance. Illinois launched its opioid alternative program on Thursday. The program allows patients immediate access to medical cannabis if they have a current prescription for opioids or would have been prescribed one.